This is another of my matching 2 piece acrylic painted recycled wine bottle sets. It is my entry into the "Repurposed: Art from Recycled Materials" art show. This set takes the "One man's trash is another man's treasure" to new heights(!) I found these empty wine bottles in the trash compacter room, and went to town. I was trying to convey the symbolic contrast of beauty/ugly and trash/treasure that's why they seem to be, at first hideous, but you can see the beauty if you look deep enough. This particular 2 pc. set is based on an episode of Rod Serling's TV series; the "Twilight Zone". It's the episode titled: "Eye of the Beholder", which was a social commentary that dealt with physical beauty and "outcasts". In the episode plot, conventionally attractive or beautiful people were considered ugly & grotesque, & ugly people were considered beautiful(!) In the end, we come to see that beauty really is in the eye of the beholder (and that one man's trash is another man's treasure). 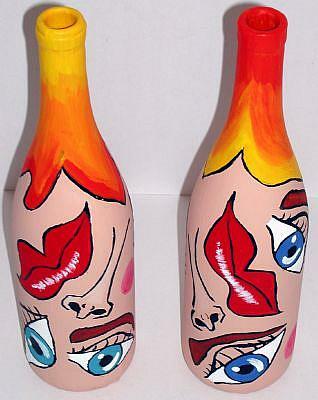 Because the support I used here are curved 3D objects, I also painted not just the "front" view, but also the "rear" view of the bottles, so that they can be turned around to display an entirely different view, effectively "doubling" the artwork, so-to-speak. To achieve the look, I first removed the labels by soaking them off, and cleaned the bottles, (with boiling water) then I coated the bottles with at least 2 coats of white gesso, and then painted on the colors and details on top of that. 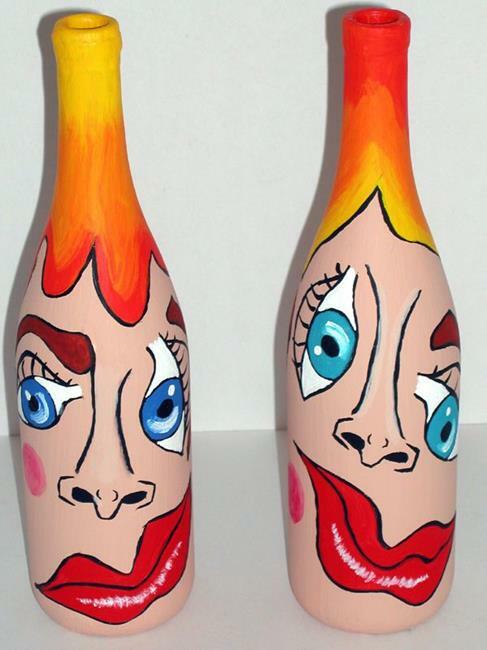 To get their glowing "firey orange-red hair" I used a blend of yellow into orange into red on the first bottle, and then blended in the reverse direction on the second bottle, (i.e. red into orange, into yellow). 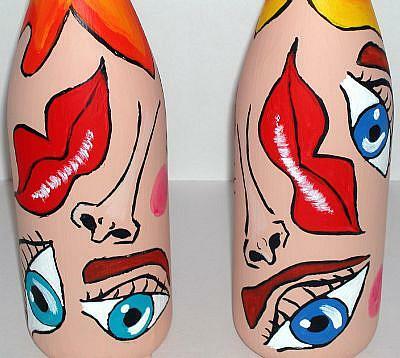 These pieces are very bright and will be sure to garner lots of attention from friends and family. I chose to use these old empty wine bottles, because they can be used as bud vases for beautiful flowers, further emphasizing the "ugly/beauty" oxymoron. 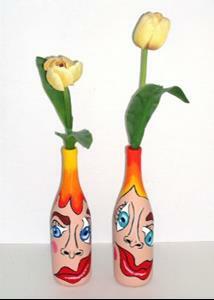 (I show a photo of them here with beautiful yellow tulips inside). Some of the colors I used are: Cadmium yellow, orange, red, blue, bluegreen, fleshtone, white and black. 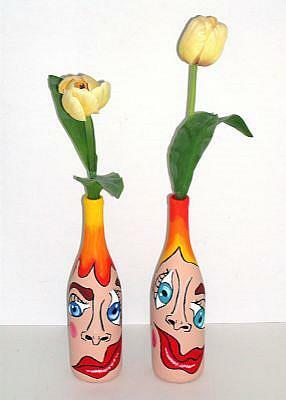 View as Functional ARt with Tulips sprouting from their heads!